Do you prefer a less spooky approach to Halloween decorating? When our kids lived at home we were THAT house on October 31st. Little kids were terrified to walk up the driveway. When our kids left the nest, all the scary Halloween decor went with them. 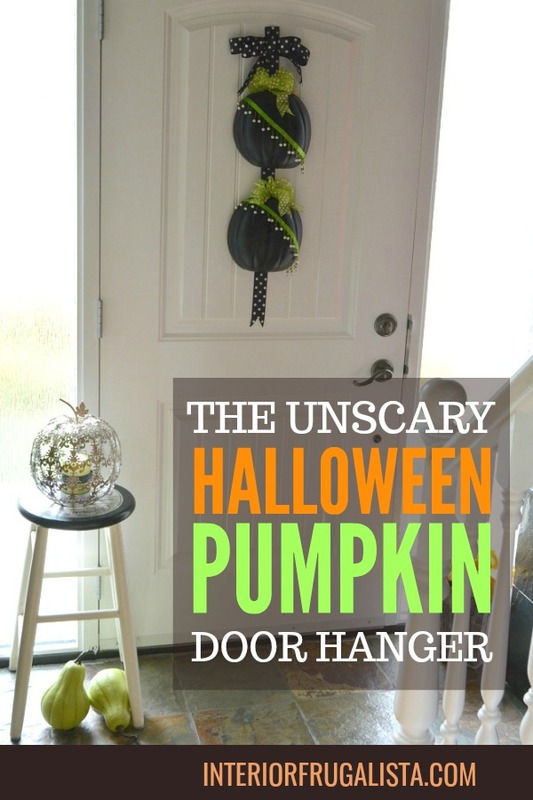 Now that we have young grandchildren, I prefer a more inviting and child-friendly option like this unscary DIY Halloween pumpkin door hanger. 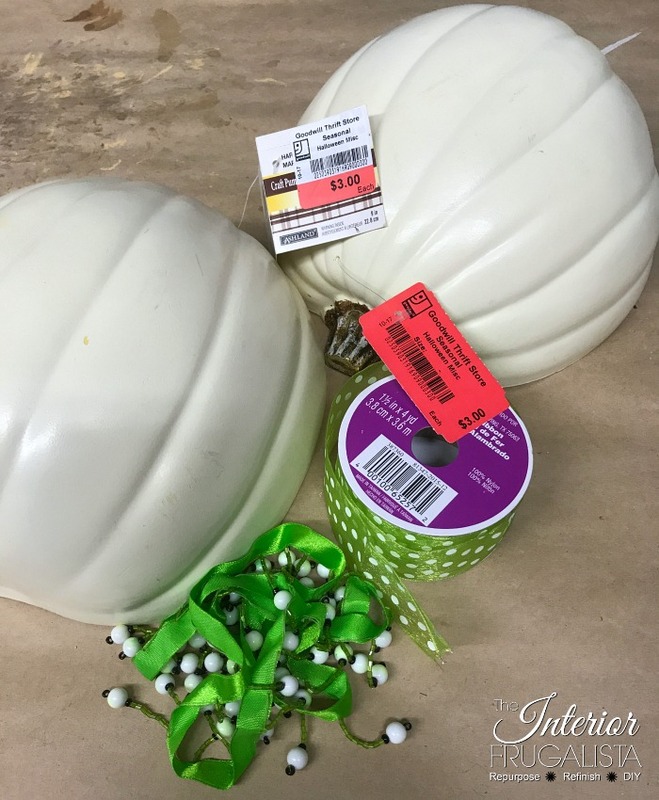 It all started with a trip to Goodwill late in the Fall last year where I found these white craft half pumpkins on clearance. Too late in the season to do anything with them, they were tossed in my craft bin and forgotten until recently. Also in the craft bin, I found remnants of beaded ribbon from a scarf my daughter made in sewing class eons ago. Looking closer at the beads they reminded me of glow in the dark crystal balls and the wheels started turning. To make the pumpkins look more Halloweenish, I painted them black with chalk paint in the most fitting color, Raven. 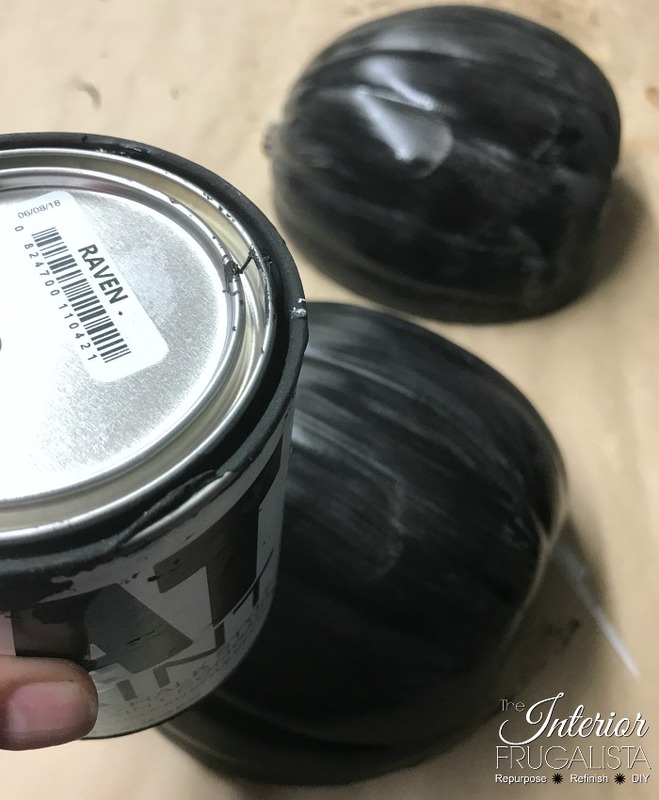 Any black craft paint will work to paint the pumpkins or better yet, save yourself the time and buy black half pumpkins. I made loopy style bows to attach to the stem of each pumpkin. 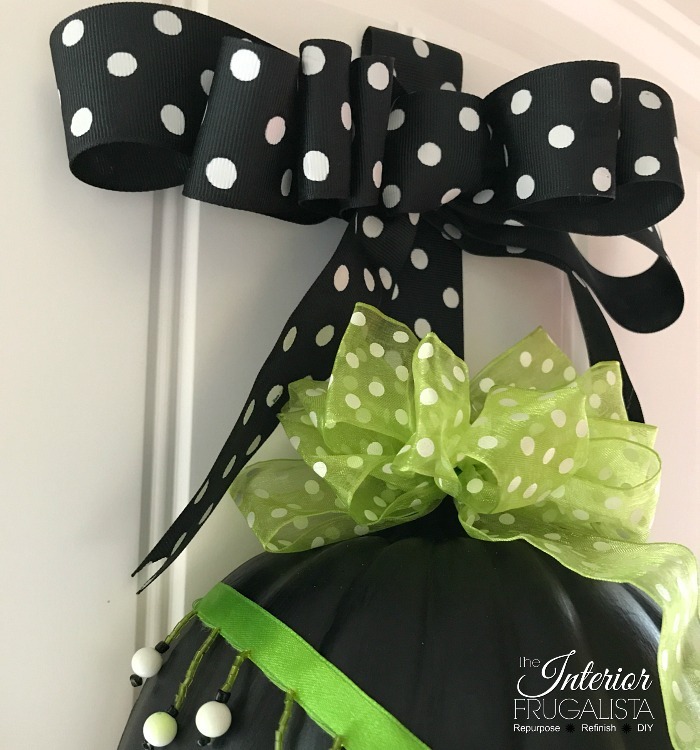 I used one spool of ribbon for both pumpkins but for fuller bows, use one spool per pumpkin. 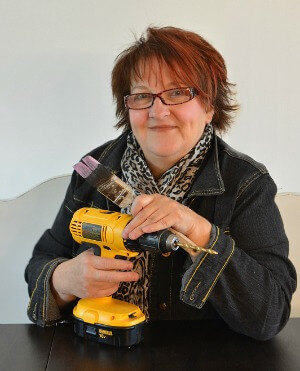 I am all thumbs when it comes to making bows so I cheat and use this handy EZ Bow Maker. I don't know what I'd do without this thing! 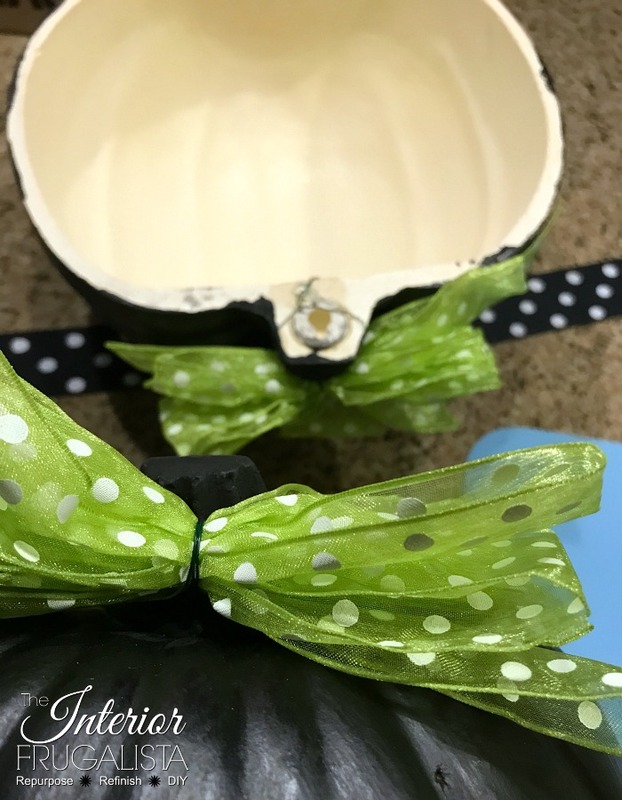 The bows were attached with florist wire onto the back of the pumpkins and secured with hot glue. 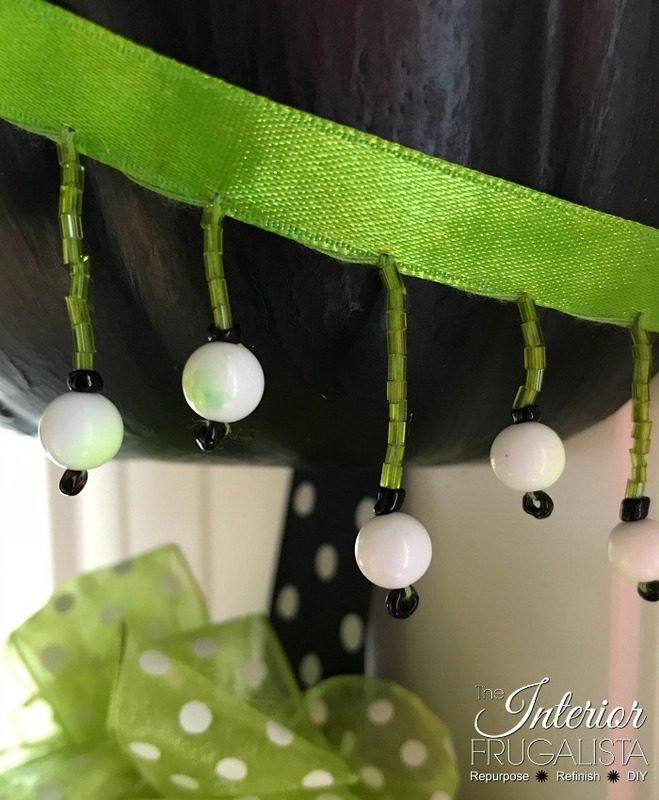 The beaded ribbon was strung diagonally across the front of the pumpkins and hot glued in place on the back. 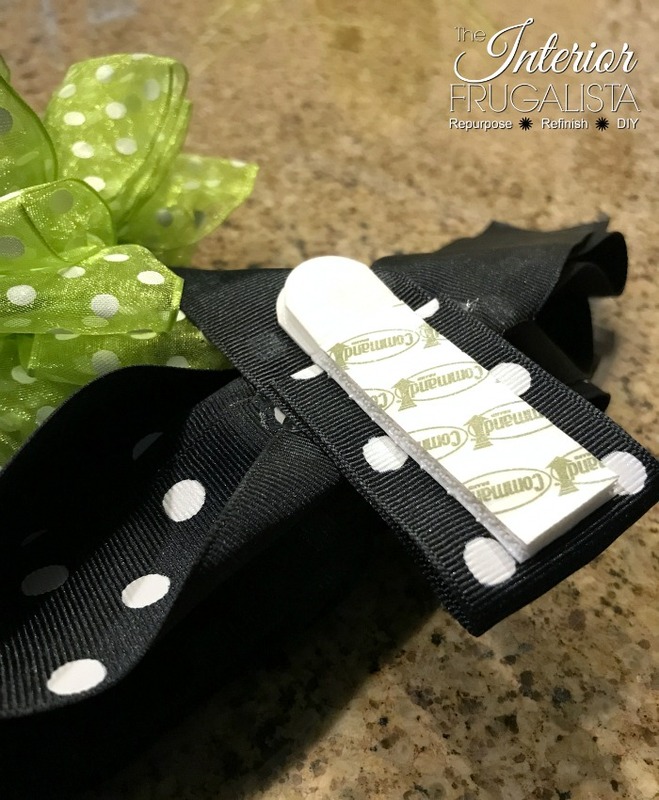 With a 1 1/2-inch wide black ribbon in either polka dots like mine or black & white stripes, cut a strand approximately 24-inches long. For a nice clean edge on the top, fold the ribbon over to the back and secure with a dab of hot glue. 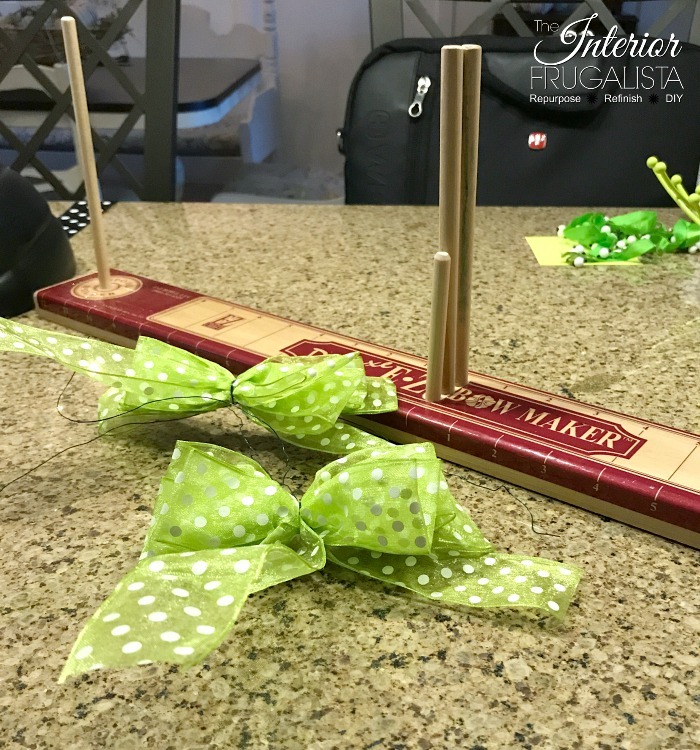 Again using my EZ Bow Maker I made a layered swag style bow for the top of the hanger which was attached with hot glue. Part of me wonders if I should have gone with a simple bow. There are no rules, go with whatever style bow is your preference. 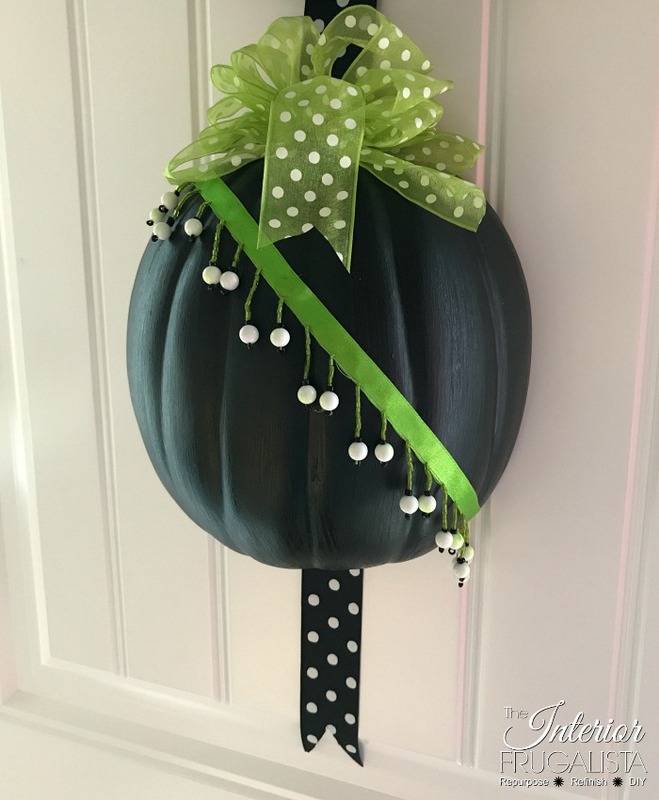 Dab hot glue onto the back of the stem and bottom center of each pumpkin and line them up on the hanger ribbon. You can either space the pumpkins evenly along the ribbon or do what I did and have a longer tail on the bottom. My bottom pumpkin was glued approximately 7-inches from the bottom of the ribbon. The top pumpkin was glued 3-inches below the hanger bow. Cut the tail on the ribbon with a V cut. 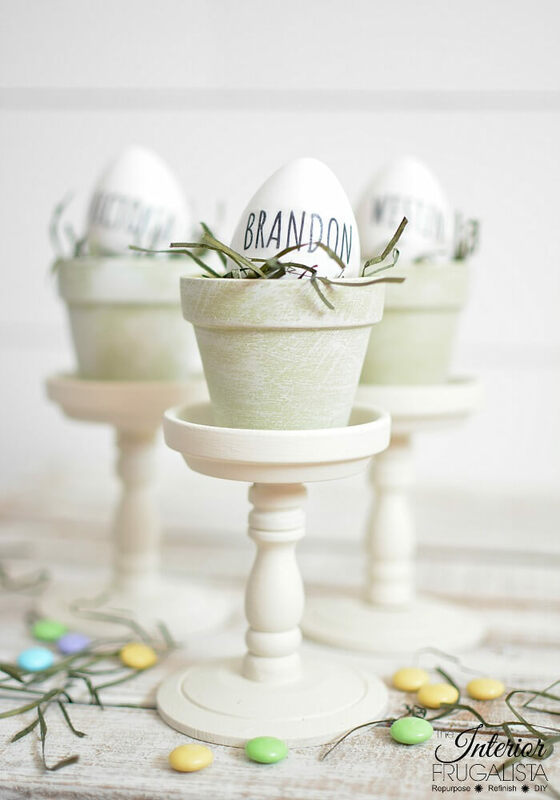 While you have the scissors in hand, cut the ribbon tails on the stem bows as well. Fold the ribbon in half, good side to good side facing each other. 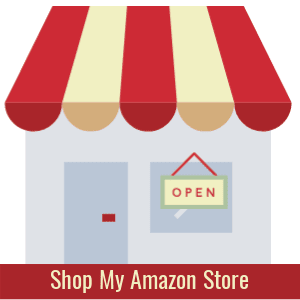 Cut at an angle away from you pointing towards the bottom edge of the ribbon. 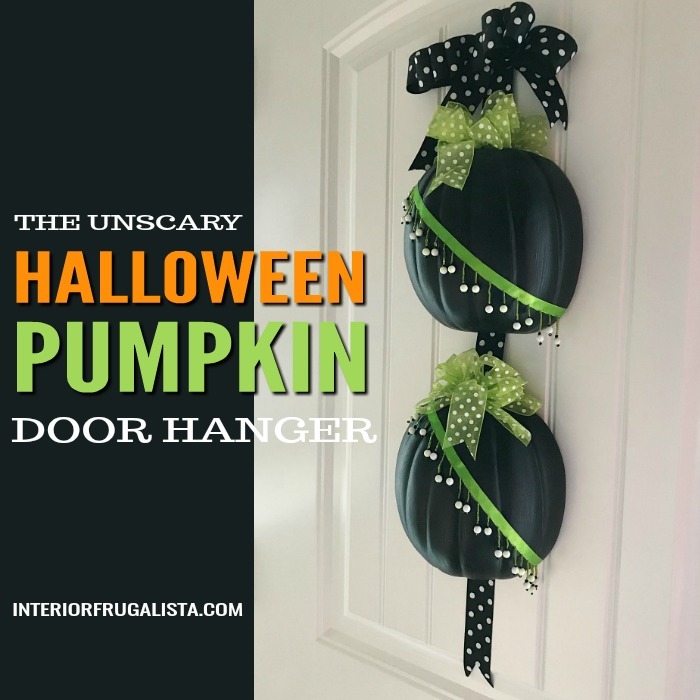 Easy peasy perfect upside down V.
Attach a 3M Velcro Strip to the back of the pumpkin door hanger at the top. Removed the sticky backing and attach the back of the hanger onto the door. So the door hanger doesn't swing back and forth when the door is opened and closed, add another velcro strip on the back of the tail as well. Voila! Assembling the unscary Halloween pumpkin door hanger is so quick and easy and only takes around 15 minutes. The most time-consuming part was waiting for the pumpkin paint to dry. 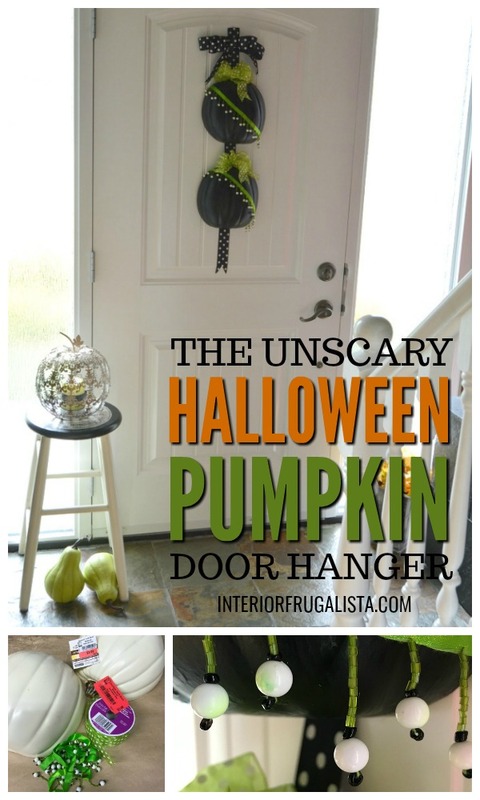 If you like the idea of unscary Halloween decor, please pin for later and share it with a friend. 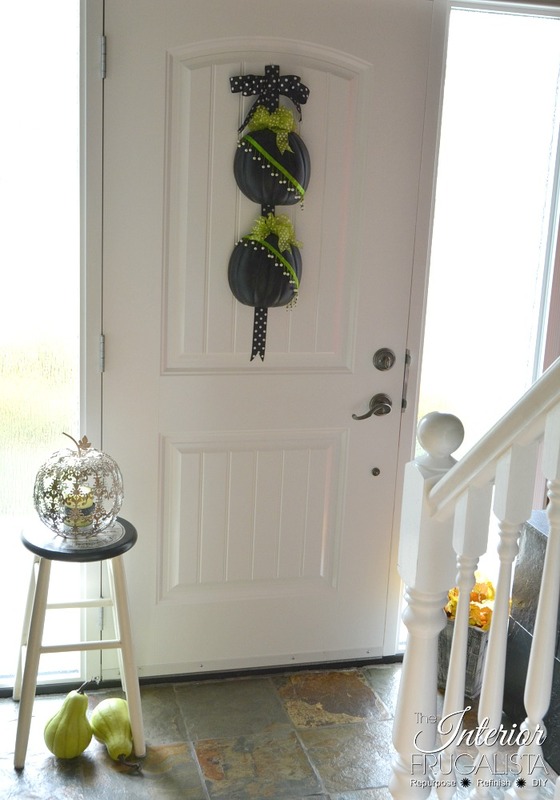 Here's another unscary pumpkin idea to flank the front door with these DIY Pumpkin Topiaries. 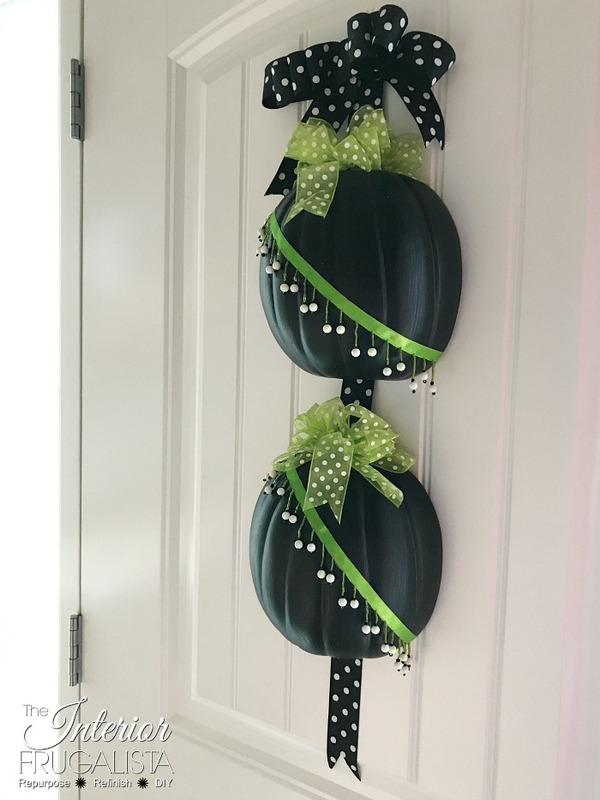 The ribbon could be switched out to match the ribbon on the pumpkin door hanger and eliminate the wood letters. 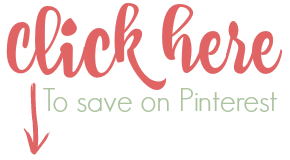 For more DIY Fall decorating ideas press HERE.